Our organization's goal is to INSPIRE in you a love for Jesus Christ, and a passion for righteousness; help EMPOWER you to have grace and forgiveness toward others as well as yourself; ENCOURAGE you to choose joy and laughter, embrace who you are in Christ, pursue your dreams, set realistic goals, choose wisely, implement virtues, take calculated risks, set healthy boundaries, build on your God-given strengths, find your life’s purpose; EQUIP you to reach your full potential and to bring God's healing love to you so you can share it to a broken and hurting world; and DISCIPLE you into a deeper relationship with God. Most of all we want to WALK with you and HELP you enjoy your life’s journey by taking baby steps toward joy one day at a time! All Rights Reserved and not to be used without permission. 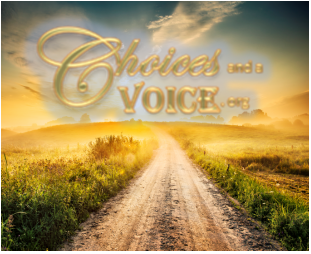 All logos are trademarks of Choices and a Voice.org® and its divisions. These and all other trademarks used are the property of their respective owners.